OSLO, NORWAY--(Marketwired - Oct 24, 2017) - Airthings, manufacturer of the first smart radon detector for continuous and easy use, today announces the results of a detailed survey targeting homeowners in the United States. 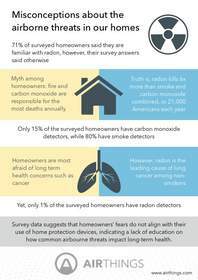 The survey results highlight confusion among American homeowners regarding common threats that are present inside the home, and shows that most homeowners are not aware of the severity of indoor gases and which cause the most harm. Key findings of the survey reveal that 38 percent of respondents believe that house fires are responsible for the most deaths annually, while 33 percent of survey respondents believe that carbon monoxide is responsible for the most deaths. In fact, it is radon that claims the most lives, killing approximately 21,000 Americans each year. Less than 6 percent of respondents chose radon, an invisible gas emitted from the ground that enters home, schools and buildings through a variety of different ways. The data also suggests that homeowners' fears do not align with the precautions they take to protect themselves inside their homes. For example, while radon lingers in one in every 15 homes in the United States and is the number one cause of lung cancer among non-smokers, less than one percent of survey respondents have installed a radon detector -- this seems to contradict the fact that 92 percent of the respondents are afraid of long-term illness such as cancer. Additionally, less than 16 percent have installed a carbon monoxide detector, although there's an obvious fear of the odorless and colorless gas. "Our study proves there should be more education around harmful gases lingering inside the home -- especially radon -- since homeowners are not testing for the silent killer," said Øyvind Birkenes, CEO of Airthings. "Most people are simply unaware of the dangers associated with radon and other odorless gases, and therefore are not monitoring indoor air quality effectively in their homes. Our mission is to generate awareness and bring an easy-to-use radon solution to the masses that can save lives." The survey results also show that people are willing to spend money on preventative health measures like eating healthy (32 percent), regular doctor check-ups (26 percent) and working out (8 percent). According to the data, 29 percent of those surveyed spend money on all three of the aforementioned measures. This indicates a lack of education on how environmental factors, such as gases in the home, impact long-term health. To find more information on radon and long-term detection options, visit Airthings website at www.airthings.com/us. Airthings is a Norway-based company that develops and manufactures both professional and consumer-grade technology that has completely changed the way people monitor and analyze radon levels in indoor air. Founded in 2008, the company's products have made radon detection efforts easy to deploy, accurate and simple to understand - all of which are current challenges with other solutions on the market. Airthings is on a mission to ensure people around the world take control of their air quality through simple, affordable and accurate solutions. For more information, visit www.airthings.com/us.